"The SSWPB's dedicated members inspire wherever they perform." 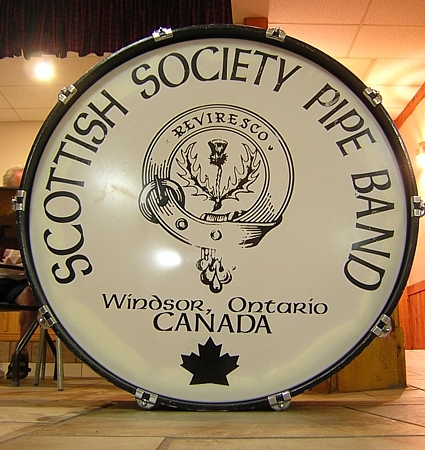 As Canada approached its 1967 centennial, Scottish Society of Windsor co-founder and longtime piper Bob Murray decided that the city ought to have a pipe band to represent its Scottish heritage. 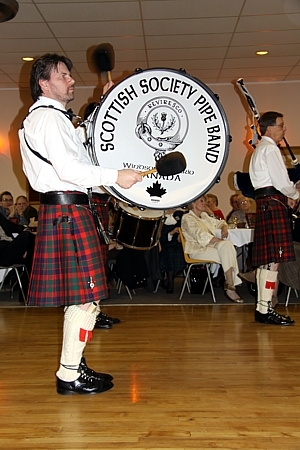 Soon after the Scottish Society was formed in 1964, he began to recruit young people from the society's membership to form the first Scottish Society of Windsor Pipe Band. Dedicated and disciplined, this fledgling band began to receive invitations to play at events all over the city and in Detroit, and even played at the opening of the Windsor Raceway in 1965. The pipers and drummers, clad in the ancient Murray of Atholl tartan, practiced for the city's centennial parade on Ouellette Avenue to get a feel for piping while marching. Participating in that important event was indeed one of the band's early highlights. Another highlight came in 1971, when the band recorded a thirty-minute program for the CBC. Eventually, however, the competitive band lost members as the players ventured off to university or dedicated themselves to new families or careers, and it was dissolved for a few years during the 1970s. The Scottish Society tried to revive the band, but the second incarnation was short-lived. Then, in 1984, President Allan Fullerton contacted three club members who played the pipes - Ian Hart, Jim MacArthur, and Neil MacLaughlin - and asked them if they would be interested in forming a non-competitive pipe band. 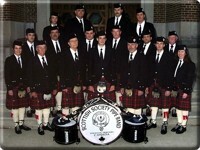 This small group formed the basis of the Scottish Society of Windsor Pipe Band (incorporated 1985) that exists today. 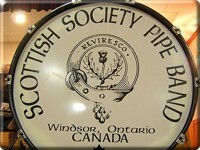 The band shares its motto with the society: reviresco. 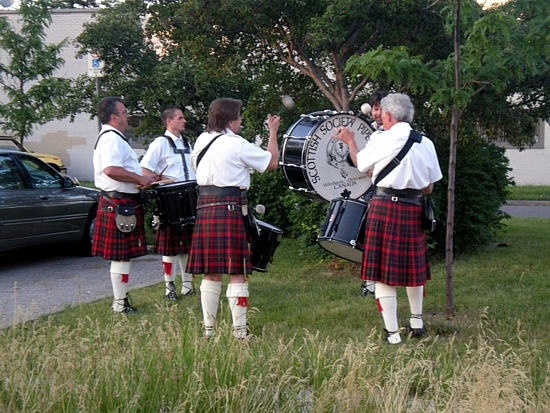 According to Pipe Major George Kay, the word means, "Never miss practice." Either that or "I grow strong again," a reference to the struggle for continuation that both the society and the band have faced in the past. Since 1990, the band has worn the Glasgow District tartan with the city's blessing. That year, Lord Provost of Glasgow Susan Baird (1988-1992) visited Canada; when she was stopped over in London, Fergusson went to ask her if the band could have permission to use her city's tartan. After Baird returned to Scotland, she sent the pipe band two dozen tartan neckties. 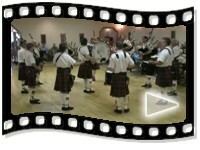 During the early 1990s, the pipe band began to discuss the possibility of traveling to Scotland. In 1994, Stirling-born Pipe Major Jim Stuart decided to launch a fundraising initiative to take the members overseas. 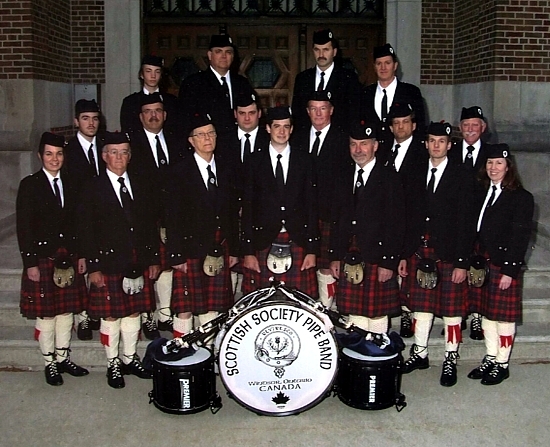 By performing in concert and inviting a Grade 1 pipe band to play in the Scottish Club, the band raised enough money to take the trip later that year. The next summer, the band had the opportunity to travel to Edinburgh to march in a parade, part of the world-famous Edinburgh Military Tattoo. The band returned to Scotland in 1997 and 1999, and made its last trip in 2001. These trips have given Pipe Major George Kay plenty of opportunities to return home. Born in Kirkcowan, Dumfries and Galloway, Kay came to Canada in 1975 to seek work. He spent ten years mining in Saskatchewan, Alberta, and the Yukon before coming to Windsor. 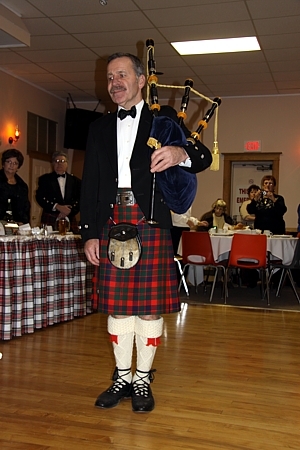 Kay, who had been involved in the South Alberta Pipe Band, joined the Pipes and Drums of the Essex and Kent Scottish Regiment upon his arrival. After training, he went to Ottawa and passed the trade qualifications to become a proper army piper. He spent several years piping with the regiment before joining the Scottish Society Pipe Band in the mid 1990s. Willie Ross, Pipe Major at that time, chose Kay to be Pipe Sergeant. 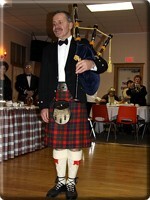 Kay succeeded Ross as Pipe Major when Ross left the band in 2001. Pipe band president Barbara Dewar joined in 1999 after having first taken piping lessons at the Scottish Club. She was introduced to the Great Highland Bagpipe by her teenage daughter, Jill, who had moved on to the pipes after having taken Highland dance lessons for years. 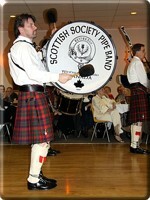 Barb was elected president of the pipe band in 2006, and re-elected in 2008. "They wouldn't let me out of [the presidency]!" she joked. Barb, whose paternal grandparents came from Paisley, Scotland, was married to Jack Gardiner, a first-generation Canadian born to immigrant parents from Airdrie, Lanarkshire. Barb and Jack's three children, Jill, Sarah, and Sean, therefore, grew up in a household that celebrated Scottish heritage and culture. The girls were both active in Highland dance with their mother in the 1980s, but their interests were drawn elsewhere as they got older. Barb, meanwhile, gave up dancing after becoming pregnant with Sean. She took up piping in the 1990s after her daughter began taking lessons at the Scottish Club. "Since I was driving here all the time I thought I might as well learn," Barb said. Soon Sarah joined her mother and sister. Not wanting to leave eight-year-old Sean out of family activities, Barb brought out her youngest to be a drummer. 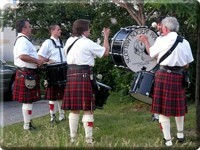 Barb, Jill, and Sean are all still involved in the pipe band. Sarah, an accomplished musician who is also self-taught on both the piano and fiddle, lives in New Brunswick and pipes in a military regiment. The band, with members spanning multiple generations, seems to attract families. Bruce Tait plays with his two sons, Iain and Stuart, the band's drum sergeant, and Ian Hart is teaching the pipes to his fourteen-year-old grandson, Alec, who wants to join the band.